Blue bubblegum bubbles in the blueberry bush. The weather has been pristine these last few days in Vermont. 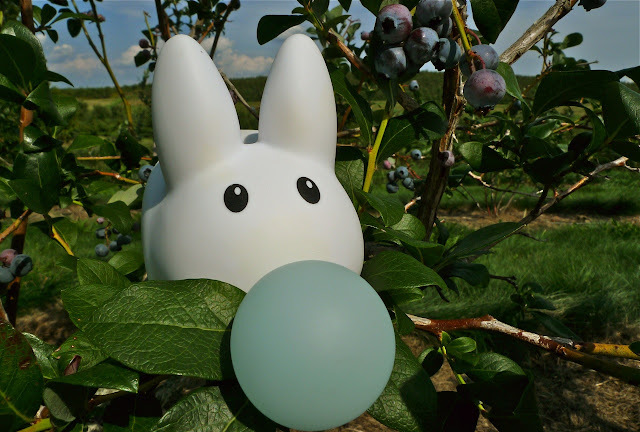 Pipkin decided to go blueberry picking today, and since it's a lot more fun to go with friends, he invited the two bunnyfish and his new friend the jackalope to go pickin' at Green Mountain Orchards in Putney, Vermont. It can be a hot and sweaty affair without any shade in the orchard, but sunshine is what makes these sweet berries grow. It didn't take too long for these three to pick 4 pounds of berries. At $1.95 a lb, that's a bargain, for fresh, ripe, local blueberries. Despite the sweaty brows, these buns are all smiles. 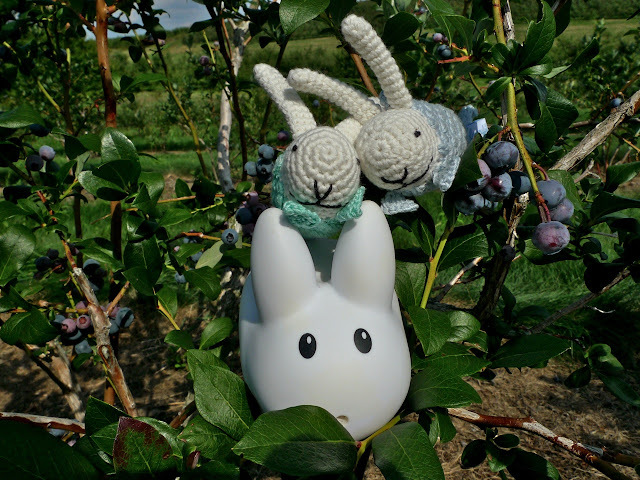 Piled into the blueberry bush, Pipkin's a little worried they will fall out. The bunnyfish don't seem concerned. Pipkin is friends will all sorts of buns. His bunnyfish friends are half bunny, half fish, and his new jackalope friend is part bunny, part antelope (or deer). He's got some fierce fangs and antlers! Whatever these bunnies' differences, they all agree that blueberries are the bomb. 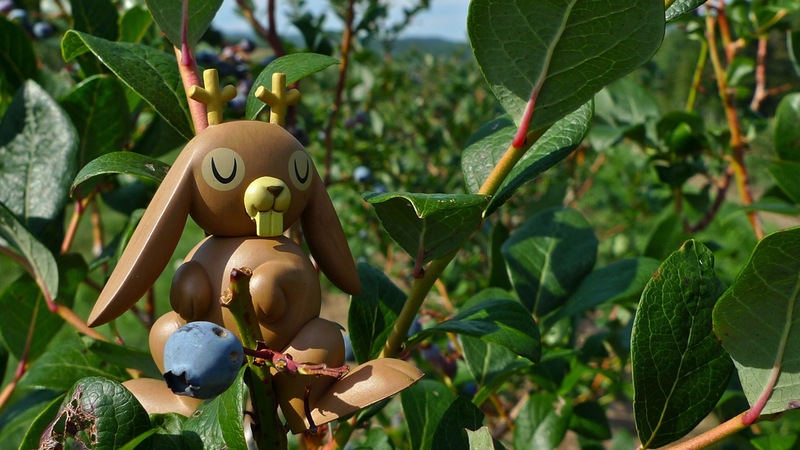 Summer isn't over yet, so get out there and pick those last summer berries before they're all gone! Pipkin and his jackalope friend need to take a trip out west to meet some of the wild western jackalopes! They may be a bit rough around the edges, more used to beans and toast than vegetables, and spend a lot of time in the saddle, but the local jackalopes are a welcoming bunch despite their rough looks.